Our Saturday morning program for children ages 3.5 – 5 years old. 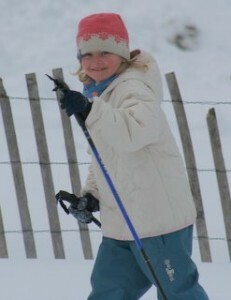 This program is designed to introduce your child to skiing in a fun and playful manner. We meet at 10:15 and finish about 11:00. Our shop has some real ski boots beginning with size 26. For those who would prefer, we have a few new sets of over-snow-boot skis, great for the younger ones who may prefer to stay in their cozy snow boots. Cost: $20 per session (includes rental, trail pass and instruction). $10 Bring a buddy to join in for an additional $10, 1 time only. Click here if interested in the Bill Koch League (BKL) run by our local Frost Mountain Nordic Ski Club with lots of help from Parent volunteers.